Is it stressful for you and your cat when getting ready to go to the vet? Here are some tips on getting your cat into the carrier and visiting the veterinarian. Do you understand your cat’s daily needs and behaviors? Visit these sites for helpful information and tips for a better life for your cat! Generally speaking, we also recommend you feed a diet formulated for kittens until your cat is approximately 4-6 months of age. After this time you may slowly transition to an adult formula over a 4-6 week period. Cats over 10 years of age may benefit from a senior formulated diet that contains supplements like glucosamine and omega-three fatty acids. Dietary recommendations will be discussed at each health visit while we assess your pet’s weight and assign a body condition score. Our hospital believes in the benefit of nutritional management of disease and we carry prescription diets as part of a multi-pronged approach to disease management. HOW we feed our cats is as important as WHAT we feed our cats. Learn how to feed your cat to benefit them physically and emotionally. Are you having difficulty with this? If so, please let us know right away since the sooner it is addressed the more successful we will be. Did you know that cats need dental care too? Feline Heartworm Disease is a real threat for both indoor and outdoor cats. There is no treatment for heartworm disease in our feline patients. 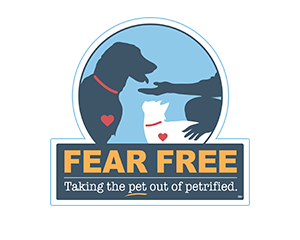 We recommend year-round heartworm prevention. To learn more about heartworm disease, visit The Heartworm Society. Are you having trouble introducing your new kitten to your adult cat at home? Is this your first cat? Here are some tips for introducing any cat to your household. Powered by feline veterinarians, the cat community provides you with credible, valuable, and reliable educational information. You can learn more about your cat’s innate behaviors, the importance of routine veterinary care, how to take great care of your cat, and answer many of your questions. At Fundamentally Feline the focus is to address all aspects of a cat’s behavior that can be improved upon to help both cats and humans live more harmoniously together. Cat behaviorist Ingrid Johnson provides great advice, how-to videos, and even a place to purchase enrichment toys.